There are several open source and enterprise software program through which we can access remote system. These software becomes a necessity when you setup a remote server and do not allow direct access to the server, as because of some security measures. PuTTy is one of the major terminal emulator through which we can access a remote server. PuTTy is a free and open-source terminal emulator, serial console and network file transfer application. It supports several network protocols, including SCP, SSH, Telnet and rlogin. Here, I am going to show you how to access Kali Linux through PuTTy. My base computer is running Windows 7 and Kali Linux is installed in a VMWare Player. So we can assume that Kali Linux is installed in a remote machine, as Windows 7 and of Kali Linux is on different network now. Before we access Kali Linux through remote system, we need to make sure that ssh service is already running in Kali Linux. In case it shows [-], then it means ssh service is not running and you have to enable ssh service first. To do this type apt-get install openssh-server from terminal window. Once, it shows [+] sign it means service is enable. Now, we type service ssh start to run ssh service. Once we are sure that ssh service is running in remote Kali Linux, we have to perform one more step. Run ssh-keygen -t rsa to setup rsa key for ssh authentication and enter filename and passphrase to save the key. Once this is done we are good to go. Now open PuTTy application and type the ip address of Kali Linux (if you are not sure then type ifconfig command on Kali Linux root terminal window). Let the port no. be default, select ssh and click on open. If everything is fine then it will ask you to enter login name and password. 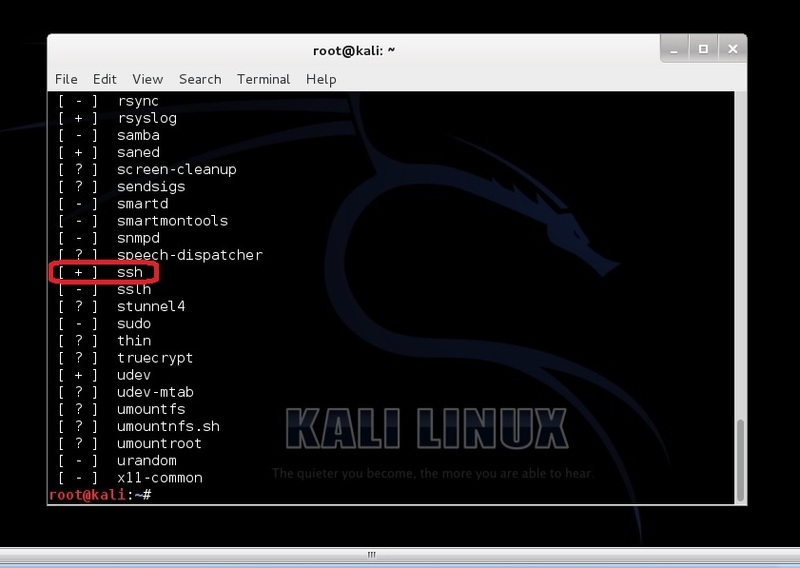 Once you enter the correct login and password, you will get privilege to access Kali Linux from console mode. Kali Linux © 2017. All Right Reserved.. Awesome Inc. theme. Powered by Blogger.